We’ve said it before: all of Harvard’s facilities adhere to a high standard of excellence that matches the prestige and acclaim of their institution. Previously, Ver-Tex Construction worked with Harvard University and Lee Kennedy on a project at the university’s business school campus. At the Ruth Mulan Chu Chao Center, Ver-Tex installed approximately 40 Mecho manual clutch operated shades and 115 Mecho WhisperShade IQ2 intelligent motorized shades using Mecho’s proprietary EcoVeil PVC-free fabrics. Once completed, our focus shifted from the business school to its main campus, where Ver-Tex worked on two separate large dorm renovations at Harvard’s Winthrop House. The first was Gore Hall. With Consigli Construction serving as the general contractor, this was a massive undertaking that included a renovation spanning over 100,000 square feet. We installed approximately 460 manual shades and 30 motorized shades on this project. Gore Hall was just one piece of Harvard’s House Renewal Program, which seeks to create revitalized student living spaces, and social and academic areas. The second project, occurring nearly simultaneously on campus, was Standish Hall. Much like Gore Hall, this was a complete renovation of the 81,000 square foot. space. Lee Kennedy served as the general contractor. We installed approximately 265 manual shades on this project. In addition to shade installation, Ver-Tex Construction also supplied a number of miscellaneous specialties including wall protection, signage, lockers, FECs, toilet accessories, appliances, and bike racks. 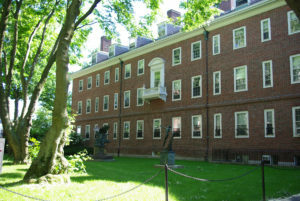 Both Gore Hall and Standish Hall were built over a hundred years ago to house freshmen and will continue to be fine homes to Harvard’s student population for decades to come.